Based on THE NEW YORK TIMES best-selling novel, The Shack takes us on a father’s uplifting spiritual journey. After suffering a family tragedy, Mack Phillips (Sam Worthington) spirals into a deep depression causing him to question his innermost beliefs. Facing a crisis of faith, he receives a mysterious letter urging him to an abandoned shack deep in the Oregon wilderness. Despite his doubts, Mack journeys to the shack and encounters an enigmatic trio of strangers led by a woman named Papa (Octavia Spencer). Through this meeting, Mack finds important truths that will transform his understanding of his tragedy, and change his life forever. 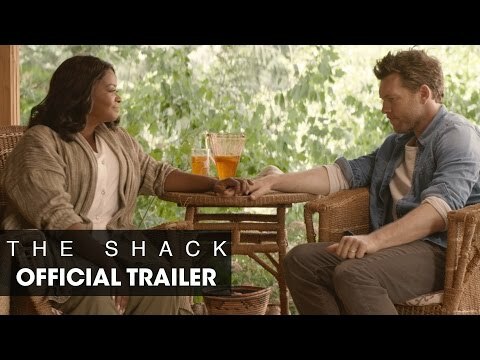 "The Shack" is a profound and creative way of revealing the unconditional love of God. Mackenzie, "Mack" (Sam Worthington), has an encounter with the Holy Trinity, at a shack following the death of his beloved daughter. The movie is heartwrenching at times, but it reveals the compassion and mercy of God even during great grief and sorrow. The themes are: forgiveness, compassion, and closure. Mack learns it takes forgiveness, including him forgiving his own abusive father, in order to move on. Mack receives a letter in the mailbox despite there being no tracks in the recently fallen snow. The letter invites him to the shack to meet with the sender, and it is signed "Papa." And Papa turns out to be a pretty important character! God is represented in various ways including as a woman (Octavia Spencer). The dialog and communication in the film is powerful. There is some brief violence, but it is not gratuitous. This film is powerful and gripping and has the potential to change lives. We are delighted to award it our Faith-Friendly Seal for ages 12-plus. "The Shack" will move audiences in a powerful way!